An exhibition of textiles developed through a creative collaboration between Indigenous poet, artist and activist Oodgeroo Noonuccal (Kath Walker) and Melbourne designers Ivana and Robert Perkins. 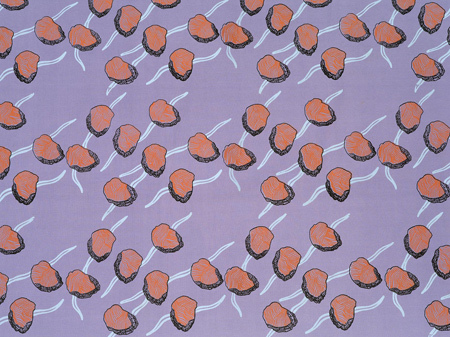 In 1978 Kimpton Fabrics commissioned Ivana Perkins to develop a range of designs for bedding fabrics. She approached Noonuncal who created patterns based on the natural environment of North Stradbroke Island. The resulting textiles with their simplicity of form have a universal appeal. Image: Oodgeroo Noonuccal (Kath Walker), Ivana Perkins and Robert Perkins, Oyster beds (detail) 1980, Printed polyester cotton fabric. Redland Art Gallery Collection. Gift of Ivana and Robert Perkins, 2012. Courtesy of the artists. Photography by Carl Warner.